From time to time, theme-junkie discontinue older themes that no longer meet the latest style and standards we want to keep. If you've bought this theme previously, don't worry! theme-junkie continue to support it long-term, and are here to answer any questions you have. Here are a few similar, up-to-date themes you might like to consider instead. Each of these is responsive, beautifully designed, and works with the latest version of WordPress. 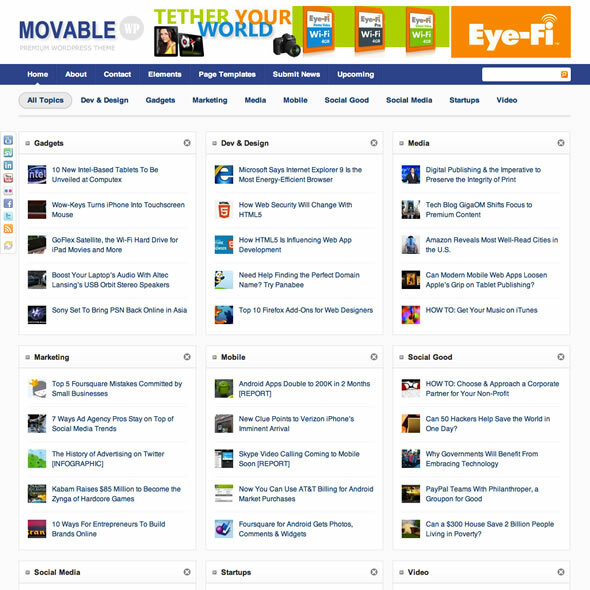 Movable is a free WordPress theme. It is an article directory style premium WordPress. The theme has very special features that allow you and your readers to collapse, move or close the news widgets on homepage. The theme is also compatible with the latest version of WordPress. Movable WordPress theme-by-theme junkie is an awesome, stylish and interesting theme to use on blogs or websites. The theme allows you to create knowledge based article directory where you can post as many articles as you want. 1. The free version: the free version is available for anyone to use. This version is commonly used by bloggers. Moreover, there are some sites that use this version and it is working well for them. 2. The standard version: this version is the best for personal projects and other related uses. Moreover, this version can be used on websites or blogs. This version has a one-time charge of $29.95. 3. The developer version: the developer version is the best version of theme to use on client projects. Therefore, if you are creating a website for your client, then you should really consider this version. This version has also a one-time charge. Yeah, I know there are several free themes available for Wordpress but I wanted to get better theme and had to pay money for this. I realize better things better amount.